Respiratory stress is common for today's horses. Environmental factors such as stabling conditions, bedding, quality of ventilation, stress, travelling, mixing with other horses and many other contributing elements can all harbour dust and fungal spores which accumulate in and irritate the sensitive lining of the lungs and respiratory tract. Horses over the age of around 6 years old that are housed in stables commonly require respiratory support due to to a variety of different inhaled allergens, including moulds, pollens, bacterial toxins (endotoxin) and forage mites. 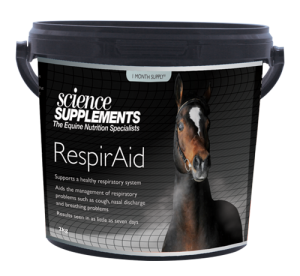 To help horses maintain a healthy respiratory system we developed RespirAid. This can help maintain the normal concentrations of Vitamin C in the airways, which is depleted when the airways are inflamed in response to inhaled allergens. RespirAid should be fed on a daily basis to help support a healthy respiratory system. It is also ideal for horses and ponies that are stabled for long periods of time with restricted turnout, or exposed to stressful situations i.e travelling, competition, change of yard or a change in hay and feed. Click on the product image below for detailed information and feeding guide.